The Rain Room at the Barbican was one of the most popular art installations of the past few years. It was incredible, featuring endlessly dripping water that magically avoided you as you walked through it. Dreamy. Well, the Rain Room’s creators (Random International) are back, teaming up this time with choreographer and director Wayne McGregor to bring you another interactive art installation to run, jump and dance around in. And this one features balls. Big ones. The work, ‘+/- Human’, has been specially commissioned for Bloomberg Summer at the Roundhouse, an annual series designed to introduce new audiences to innovative culture, whatever that may be. It’s presented in two parts. In the day, the installation is open to the public, and surrounds visitors with a flock of weirdly hypnotic, floating spheres of light. 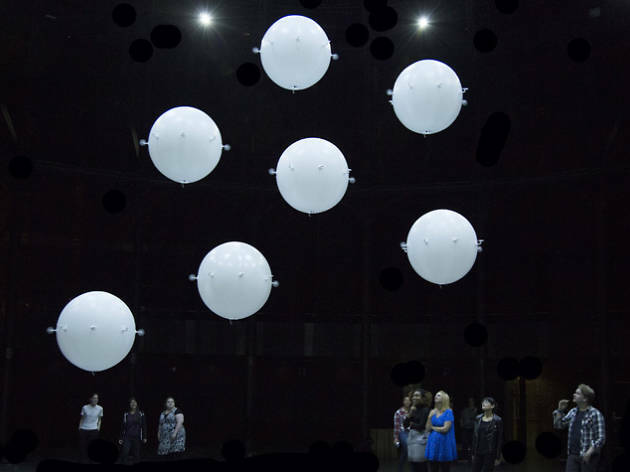 The orbs are programmed to react to their surroundings and bodies in their environment and are soundtracked to electronic music created for the installation by Mark Pritchard of Warp Records. Then on Friday and Saturday evenings, the installation will host new dance work from Wayne McGregor, featuring Company Wayne McGregor performing with dancers from the Royal Ballet. The piece will respond to Random International’s work alongside specially composed music from Warp artists. The exhibition will be running at the Roundhouse for three weeks from Aug 10-28, book your tickets here.